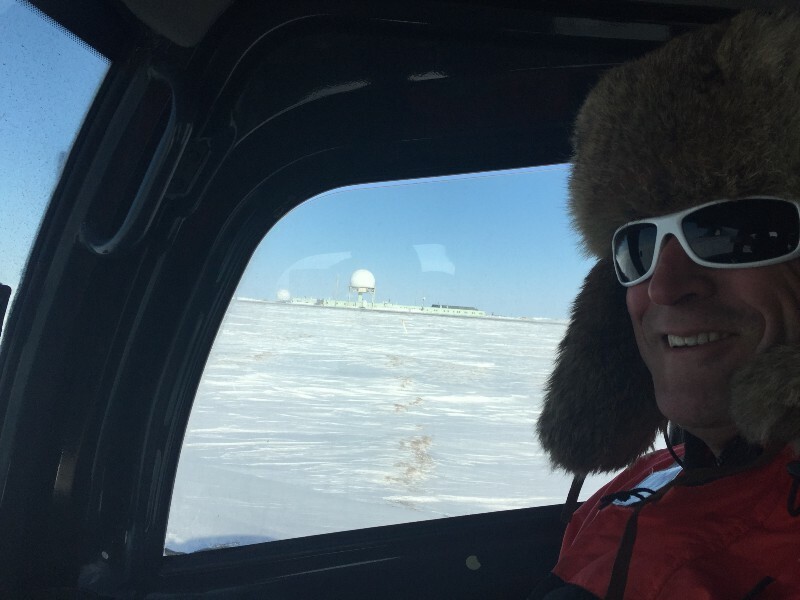 Doug surveys the Arctic tundra from inside the Kubota. It looks nice out there, but winds were up at around 35 mph today, meaning wind chill values were well below 0 F.
Winds were howling again and we were under a blizzard warning starting at around noon today. This is supposed to keep up through tomorrow afternoon, meaning that we are doing what we can on the ground, sampling aerosols with POPS and making sure that our equipment is ready. The aerosol sampling is interesting in a couple of ways — first, with subtle wind shifts, the air making it to our facility is exposed to different amounts of industrial activity. With winds from the southeast, the air that we sample is coming directly from industrial sources related to energy exploration here. When the winds shift to the northeast, the air is coming from a much cleaner region, mainly from over the Beaufort Sea. This brings me to the second area of interest in this sampling — with all of this wind, this area of the Arctic Ocean has seen massive deformation of the sea ice covering it, with many, many areas of open water. I’m anxious to see if we find signatures of this in our aerosol sampling, as open water results in a variety of aerosol particles being lofted into the atmosphere that otherwise would not be there… Time will tell. Tomorrow things get really interesting. The US Department of Energy, who is sponsoring this research, has offered us a chance to extend our campaign by a few days beyond our currently planned Saturday departure, if conditions warrant. Given that we’ve had two straight weeks of 20+ mph winds, it would be easy to say “no way” and head home… However, for the first time since we’ve arrived, the forecast is actually pointing towards calmer conditions (around 15–20 mph) on Saturday through Monday. This is the result of the Beaufort High moving towards the west, and providing us a bit of relief from the intense pressure gradient that has dominated our weather pattern throughout the campaign. Because of the logistics associated with extending, we have to decide by tomorrow night whether this is something we want to do. On the one hand, if the forecast looks promising, this is our best shot at getting in the flights we came here for. On the other hand, if the forecast looks promising but doesn’t pan out, we have to stay here for another three days and helplessly stand by as the winds continue on, knowing that we are unlikely to get a third shot at this. That would be really, really miserable. Not at all an easy decision — I’ll be studying the forecasts in intense detail tomorrow to ensure that our decision is well-informed. Wind projections for the next few days. The colors represent operational ranges for our aircraft (green=good, orange=ok, red=bad). The grey periods are times when the airspace at Oliktok is not available to us (between 8pm and 8am daily).